On Friday, Trump tweeted "WE WILL NEVER FORGET!" 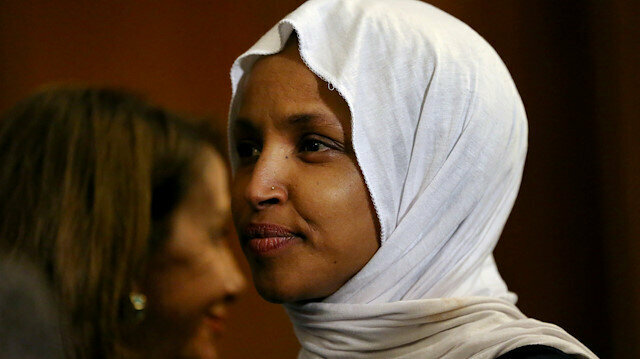 with a 43-second edited video that featured Omar's remarks at an address to the Council of American-Islamic Relations (CAIR) last month, the country's largest Muslim advocacy organization. “If we look at her mere existence, what she represents is everything Trump has been speaking out against -- immigration, Omar is a migrant. She is a refugee; she comes from Somalia. She is half Yemeni and both countries are among Muslim countries on the [travel] ban list,” he explained. The immigration restriction is the Trump administration's third, and affects people from Iran, Libya, North Korea, Somalia, Syria, Venezuela, and Yemen. Chad was dropped from the list of affected countries. The latest version of the travel ban blocks people from seven countries -- five of which are Muslim-majority -- from U.S. entry. It bars immigration from, Iran, Libya, Somalia, Syria and Yemen as well as North Korea and Venezuela. A circle of Congress members need to come around in support of Omar, according to Fahmy. “Not just Muslims but average Americans should push their representatives to support her." Fahmy also said that the international rules and values apply to everyone and that “we give individuals right to advocate how they see U.S. interests and not see it as a threat to status quo”.